This past summer, Evolution garnered a fair amount of attention during its successful Kickstarter campaign which netted over $120,000 on a $10,000 goal. Many gamers were familiar with the game’s producer, North Star Games, and their previous casual party game favorites such as Say Anything. Evolution was a big jump into strategy game design, and the result is box a gorgeous components and a very playable game for a whole range of ages and experience. 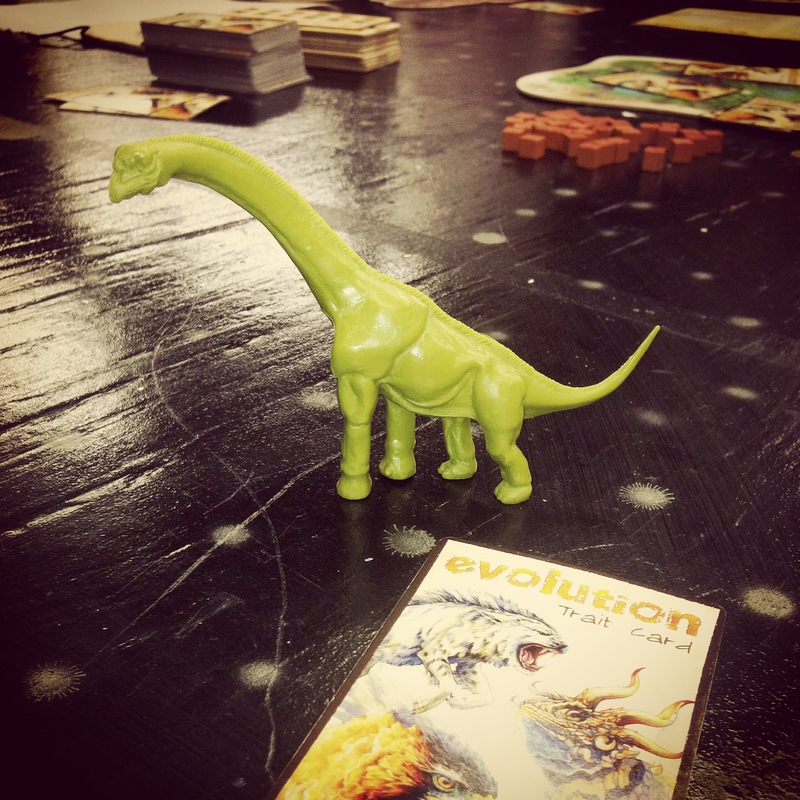 The game has been hitting the table at Metropolitan Wargamers in Brooklyn, NY over the past week or two, and this past weekend I had a chance to get in on a six person game of Evolution. Evolution begins with each player in possession of one species and a hand of four “trait” cards. The 129 beautifully painted cards are the core mechanic of the game. A player’s turn begins by throwing a required card into the watering hole at the center of the table, contributing to a food pool with the value at the lower right corner of the card. The player then decides to play some or all their other cards in a variety of ways. 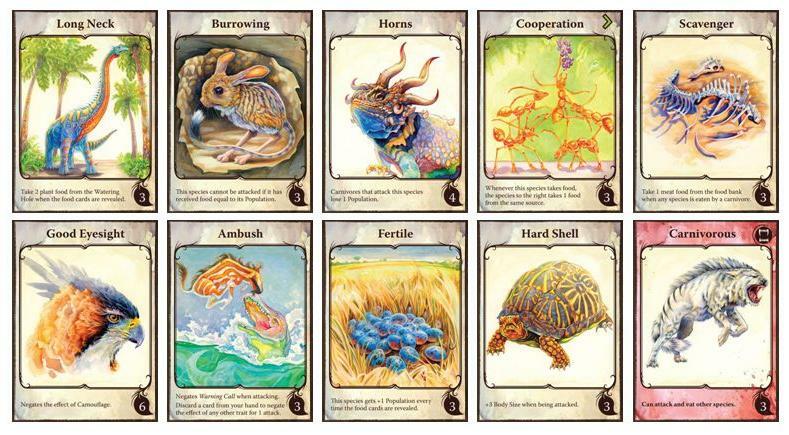 Cards may be discarded to increase a species body size, grow population, spawn an additional new species or, most importantly, evolve the species by playing trait cards. This where the real action comes in. Up to three cards may be played above a species to create evolutionary traits for that creature. Some traits provide benefits every turn with things like Long Neck allowing the species to eat first and the Fertile trait which grows species population every round. Defensive traits such as Hard Shell, Horns and Burrowing aid in providing defense against being attacked by a species with Carnivorous trait. Carnivores might add aggressive traits such as Good Eyesight, Climbing or Pack Hunting to counteract the defenses of other species. With multiple species growing in size, population and traits, Evolution plays out as nature’s arms race for supremacy and food. After every round of playing cards, all species are fed in turn from available food in the central primordial watering hole. Each species must feed up to its population size or risk a die off of that species. Carnivores by their very nature do not feed from the pool but on other species around the table, and those species must defend using their available traits and body size. 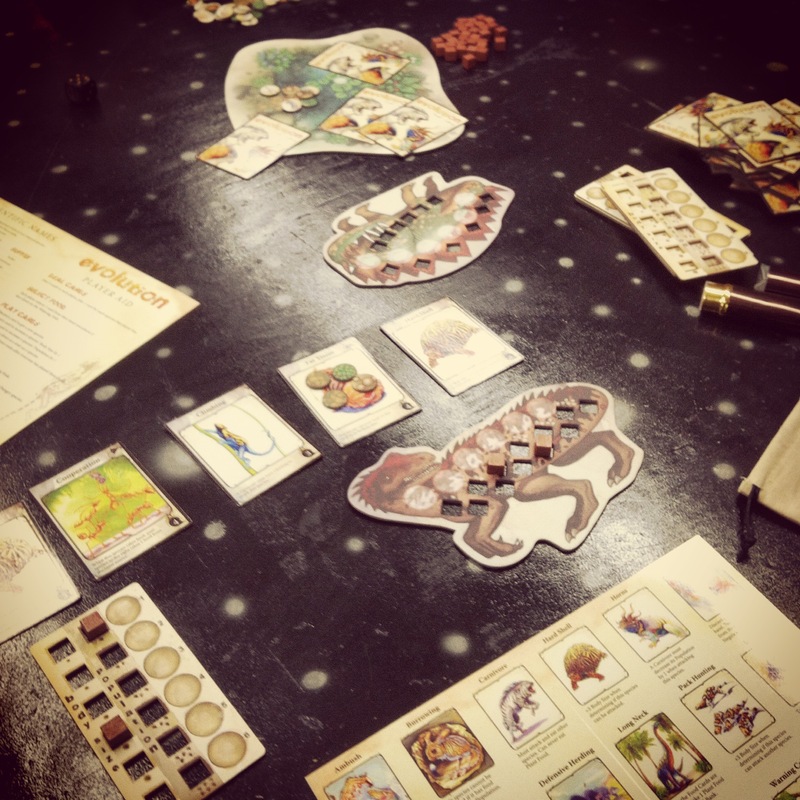 Once feeding is complete, food tokens are swept from the species cards and stored in a bag. 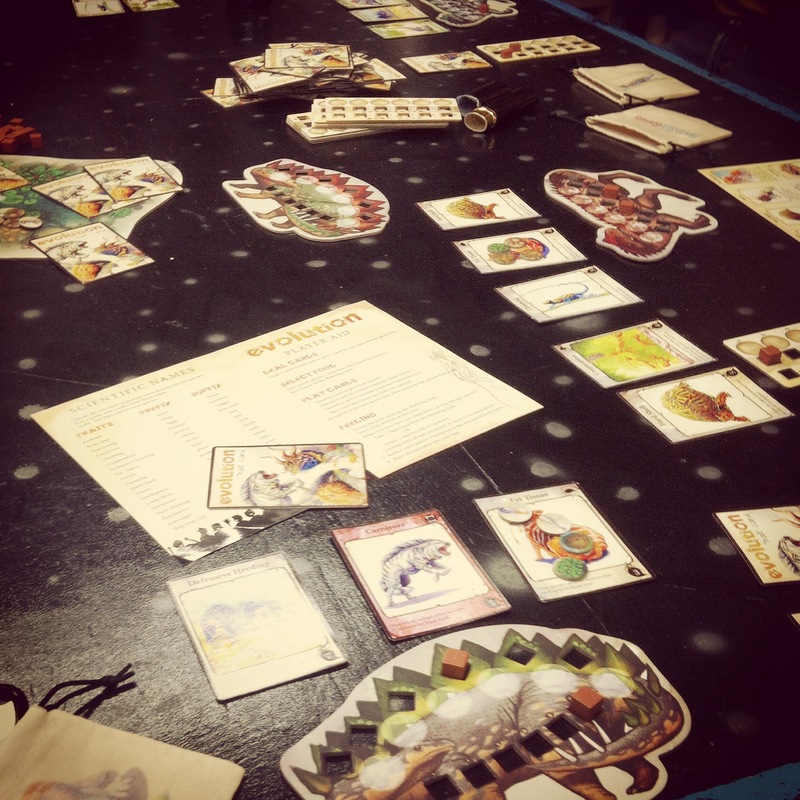 At the end of the game, the player with the most food points, living species and trait cards played wins. The designers of Evolution claim over 4000 species can be created using differing combinations of cards, and this is where the replay value really shines. Each game plays fast, with a six player game only representing about one play through the deck of trait cards. Timing and choices are critical in the game, and a player needs to figure when is the right time to create a new species or focus on building up the population or size of existing species. Keeping an eye on what other player species are evolving toward as well as the available food supply necessarily inform strategy. In my first game this past weekend, I chose to focus early in the game on scoring points by getting two species with large populations going at once. With a number of protective traits played on each of my species, I was able to hold off three other carnivore species for most of the game as they ate some of the weaker species of other players. In the end, the carnivores were effectively in a three-way stand-off with each other as the final round of food was tallied and the win went to one of them who had more than 40 points to my losing 25. 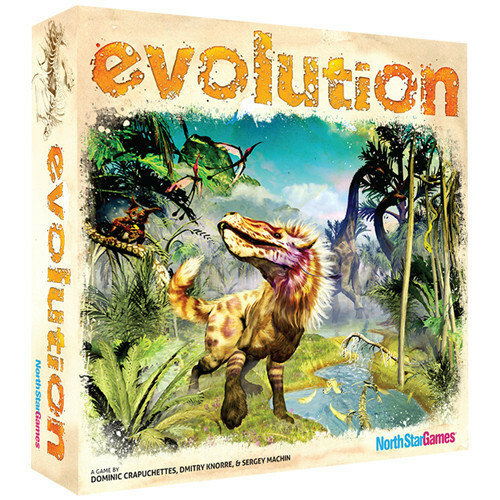 With North Star’s previous focus on word and trivia style games, Evolution is a really fantastic surprise for their entry into strategy gaming. The building, card and food resource management has a feel like so many civilization building or other Euro style games, while its relative simplicity makes the entry skill level appeal to a lot of serious and casual gamers alike. The game would be a great way to break up a school biology class or engage a dinosaur-obsessed kid in gaming. Evolution plays out with nature in all its beauty and danger, and it presents a world where only the fittest player species who can wisely manage their own growth and resources is going to survive in the end.